Stevie Wonder Announces "The Stevie Wonder Song Party: A Celebration of Life, Love & Music" Concert Series | Kicks Off Aug. 3rd, 2018 - TheUrbanMusicScene.com | Concerts & Festivals! 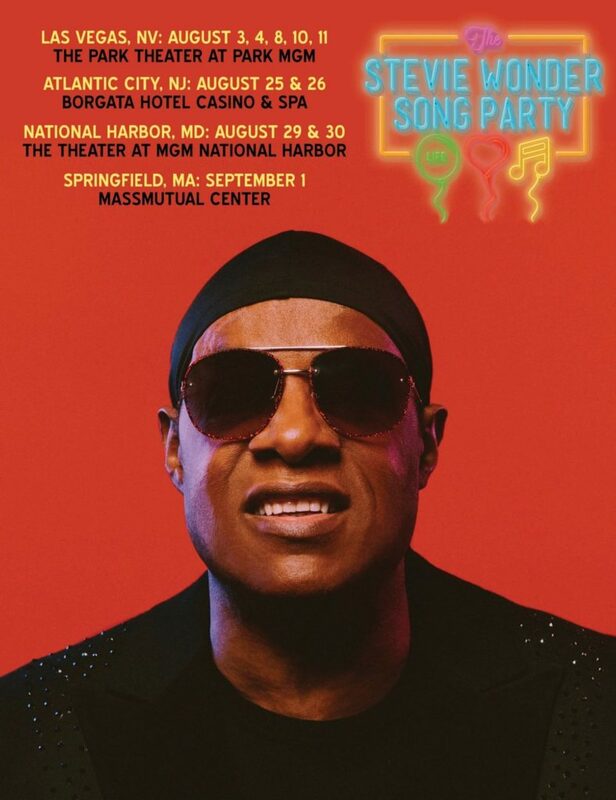 Stevie will bring “The Song Party” to four cities including Las Vegas, Atlantic City, National Harbor and Springfield where fans will enjoy an immersive, participatory experience during this run. The announcement follows Stevie’s epic private event last week in Los Angeles of the same title that was designed to give guests a sneak peek of what is in store for attendees of the concert series. Tickets start at $69, plus applicable fees, and will go on sale to the general public Monday, May 21 at 10 a.m. PT at ticketmaster.com. American Express® Card Members can purchase tickets before the general public beginning Wednesday, May 16 at 10 a.m. PT. All pre-sales will end Sunday, May 20 at 10 p.m. PT. To date, he has amassed 49 Top Forty singles, 32 #1 singles and worldwide sales of over 100 million units. Stevie has won 25 Grammy Awards, the prestigious Grammy Lifetime Achievement Award, a Golden Globe and an Academy Award. As an activist, Stevie also spearheaded the realization of “Martin Luther King Day” as a national holiday. His participation in the “We Are The World” fundraiser for hunger in Africa was a music industry milestone while his involvement to put an end to apartheid in South Africa is legendary. He is the youngest recipient of the Kennedy Center Honors, and is a Commander of France’s National Order of Arts and Letters. Stevie was awarded the Library of Congress’ Gershwin Prize for Popular Song and performed his commission, “Sketches Of A Life,” which placed him in a very select group of eminent composers who have received library commissions, including Aaron Copeland, Leonard Bernstein and Paquito D’Rivera.